An estimated 10,000 May Day protesters gathered at the Texas State Capitol for a rally and then marched through downtown Austin in support of immigrants' rights. Photo by Carlos Lowry / The Rag Blog. 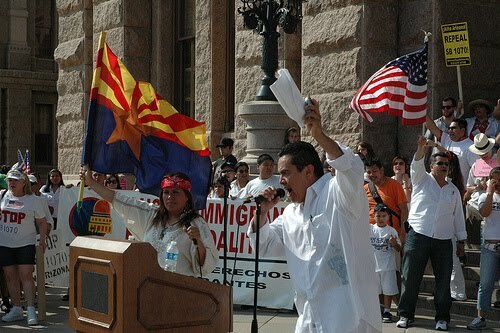 Provided with a hefty kick start from Arizona’s outlandish new immigration law, hundreds of thousands of May Day protesters in at least 80 cities around the country hit the streets yesterday, with as many as 50,000 in Texas alone. 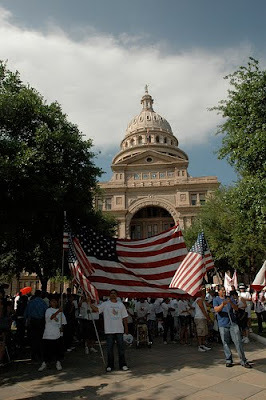 In Austin, 10,000 people filled the Capitol grounds -- a large majority of them Latino -- for a spirited rally on the steps of the statehouse, and then formed a six-block-long parade down Congress Avenue to City Hall. The biggest crowd in Texas was in Dallas, where Bishop Kevin J. Farrell of the Roman Catholic Diocese of Dallas, led 20-25,000 marchers through downtown streets. 7,500 marched in Houston. The largest demonstration was in Los Angeles, with a throng estimated as high as 100,000. Singer and Cuban emigrant Gloria Estefan, speaking from a flat bed truck, reminded the massive crowd that we are a nation of immigrants, while LA Mayor Antonio Villaraigosa told the marchers, "We need to write laws that appeal to our better angels." In Washington, a demonstration turned to civil disobedience, as U.S. Rep. Luis V. Gutierrez (D-Ill) was one of 35 arrested for sitting down in front of the White House fence, and refusing to “move on.” Gutierrez said he decided to be arrested “to escalate the struggle.” 20,000 marched in Chicago and thousands participated in other cities from coast to coast. 'Si se puede.' 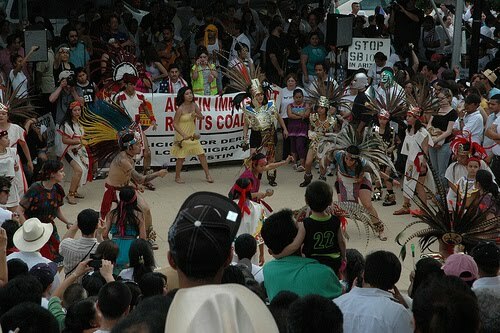 May Day demonstrators in Austin. Photo by Carlos Lowry / The Rag Blog. 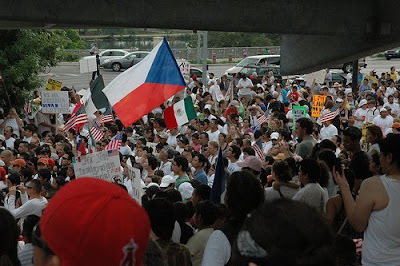 Austin’s first May Day demonstration focused on immigrant rights was in 2006. I was stunned then by an Austin crowd as large as any I had ever seen -- 30,000 -- massive numbers, snaking through downtown streets to the federal building. 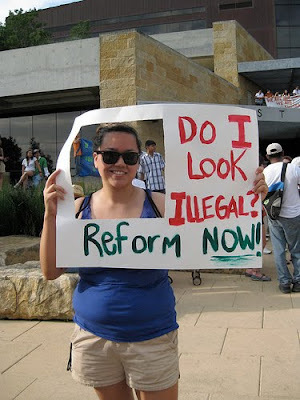 That was the year of the first national mobilizations for comprehensive immigration reform. There were unprecedented turnouts occurring in every major U.S. city, including Los Angeles, Chicago and New York. Other Texas cities -- Houston, Dallas, El Paso and San Antonio -- had large demonstrations that year. Those national mobilizations met with considerable blowback. There were rants on cable television about Mexican flags. Vigilante Minute Men got publicity for assembling on the border. 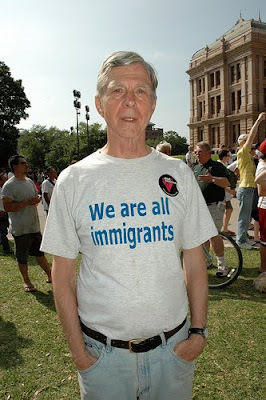 More important, there were raids on places of employment, deportations, and jailings. Along with repression, the collapsing U.S. construction sector and increased violence associated with Mexican drug cartels made for a perfect storm of declining participation in subsequent years. Arizona’s law changed all that. The broad strokes of that recent legislation make the mere suspicion of undocumented status cause for questioning and detention. The potential impact on Latinos ignited Austin’s community as well as communities across the nation. Organizers at the Austin Immigrant Rights Coalition (AIRC) -- www.airc.org -- had been holding their meetings in a small office. They moved to a church hall to accommodate the growing interest. AIRC describes itself as a grassroots, action-oriented coalition of immigrants, students, and allies including labor, faith, and community organizations. That is who they turned out for a spirited rally at the state Capitol and a march down Congress Avenue to City Hall. Like it or not, President Obama, comprehensive immigration reform demands have moved from the shadows onto center stage. Not sure. Let's see your profile. Photo by Alice Embree / The Rag Blog. Speakers, in Spanish and English, singers, and Aztec conchero dancers highlighted the Austin rally. The Rag Blog's David Holmes Morris has the final word. Photos by Carlos Lowry / The Rag Blog.